1. Railroad crossing, watch out for the cars, can you spell that without any Rs? My grandfather, Archie, always got a kick out of tricking me with that riddle when I was little. Now I'll have teach it to Annelise. 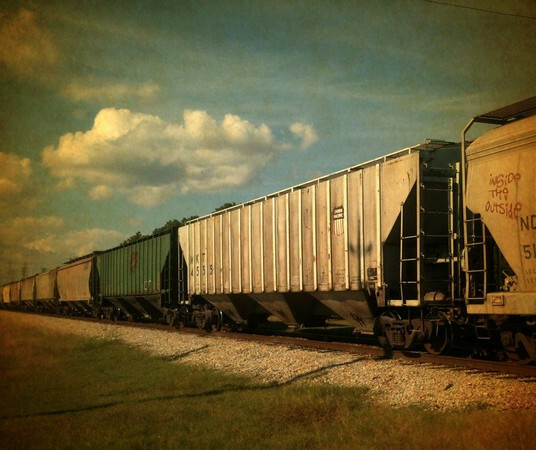 I was stopped by a train yesterday so I practiced patience by taking pictures with my iPhone. Annelise practiced impatience by begging to play on my phone, begging which was ignored by me. She settled for looking at the graffiti on the train cars. I liked that green car since it was a splash of my favorite color in a long line of oatmeal and rust. 2. I had a moment of crisis yesterday when I feared my beloved Keurig, my one fresh cup of java at a time miracle machine, was on the fritz. After fiddling with a few things and punching a few buttons stubbornly, I performed my magic trick. I unplugged it, counted to 30, whispered a prayer, threw salt over my shoulder and plugged it back in. Glory be, it worked! I don't know why that worked but it did. They, and I mean the helpful they in India, usually tell you to try that when you have computer/DVR emergencies, so why not a coffee maker. I like to think unplugging it resets the magic fairies inside. 3. Seeing Annelise at the back door with filthy hands in her chapel uniform and shouldering her backpack cracked me up, so of course I had to take a picture. That's just so her. She is reading up a storm (love), perfecting her running jump rope skills, digging math and practicing for the upcoming spelling bee. Life as a first grader is good. 4. I broke down and bought a hot air popcorn popper the other day so we will stop eating all the oils and chemicals in the microwave packets. Annelise thought this was the coolest thing EVER (she's seven, she says that a lot) and promptly perched herself on the counter to watch the action. At first taste she was disappointed but once I sprinkled some sea salt and dabbled some melted butter (hey, at least it's real butter) she was fully converted to the awesomeness of the hot air popcorn. We sat down to nibble together, sharing a bowl, while she worked on some homework. There may have also been a few M&Ms because you've got to have salty and sweet, can I get an amen? Maybe it's my Only Child syndrome flaring up, but next time I'm getting my own bowl because I just can't share with Annelise again. Imagine the handfuls of popcorn being shoved in her mouth, the licking of fingers, the immediate return of the licked fingers into the community bowl to burrow for M&Ms, etc. Ugh! I kept gently encouraging nagging her to use her napkin, but it was pretty much a lost cause. Next time, separate bowls is the way to go. 5. I had my third tap class last night, which was fun. We warmed up, practiced the steps we've learned and then started to learn a routine to Ray Charles' "Hit the Road, Jack" (love Ray). The teacher, Miss Jane, broke each segment down and we would work on it and then right before class was over we went through the whole thing with the music a couple of times. Miss Jane was very encouraging, however whenever she looked in my direction I think I detected a look a pity on her face. I am such a white girl in my tap shoes. I love that red air popper! We eat air popped popcorn a lot...almost always with some M&M's thrown in. Always have M&M's in stock. The fall colored M&M's are just about my only harvest decor going on right now. I need that red air popper! We have plastic popcorn holders that look like old fashioned popcorn boxes - I've seen where my kids hands have been and I'm NOT sharing. That train photo is awesome! Score on your solution for reactivating your Keurig! That picture of Annelise is darling! 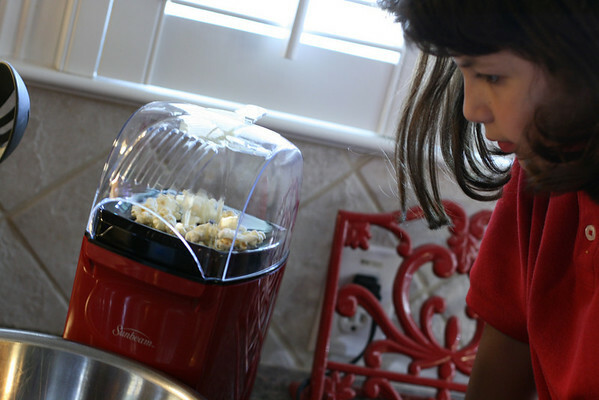 I love the red popcorn popper! We have an ugly 70's looking popper that I only use when I make caramel popcorn. I hear you on the salty/sweet combo AND on the separate bowls! I love that song! We have it on Sing Star and it is so fun to sing. I would love to tap dance to it. I love our air popper, but my kids definitely noticed the change in flavor. I do use spray butter too, so I guess we are only reducing the chemicals slightly. Way cheaper though!